There are at least 500 women currently on death row around the world. While exact figures are impossible to obtain, it is estimated that over 100 women have been executed in the last 10 years – and potentially hundreds more. Little empirical data exists about the crimes for which women have been sentenced to death, the circumstances of their lives before their convictions, and the conditions under which they are detained on death row. 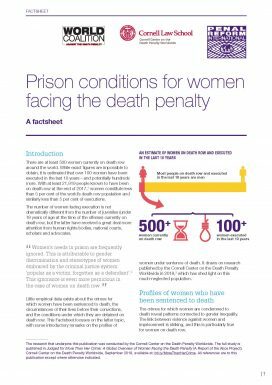 This Factsheet focuses on the latter topic, with some introductory remarks on the profiles of women under sentence of death. It draws on research published by the Cornell Center on the Death Penalty Worldwide in 2018, which has shed light on this much-neglected population. Quick answers to common questions about the death penalty.